What is a VPN and why do I need one in China? Before checking out the pros and cons of free VPN vs. paid VPN services, it’s first important to understand what a VPN service is. ‘VPN’ stands for Virtual Private Network. It is a service that provides private internet access and therefore access to sites that may be censored or restricted in the country you’re accessing it. It’s a needs must for China where several popular sites are blocked. It will be key to helping you access Facebook in China. This, as well as other popular sites such as Google services and other social network sites. Otherwise, having a VPN is also useful for privacy issues, as well as accessing sites only available in certain countries – for example, if you want to access American Netflix for those times when you’re not busy studying, and see what goodies they have on there! A VPN service is also a useful tool for ensuring security when connecting to an unsecured Wi-Fi at public places. If you want to get more clued up on what exactly a VPN is, check out our blog post. One thing to note is that you should download a VPN BEFORE coming to China. Downloading a VPN in China is difficult, but there are ways it can be done. Free VPN vs. Paid VPN Services: Which One Should I Choose? There are a whole range of VPN services out there. Many of them get blocked in China, and there is hardly a month goes by without news spreading that “China is clamping down on all VPNs”. Don’t worry – this has never actually happened (yet) and has so far just been fake news. Many of those coming to China are confronted firstly with the large amount of VPNs out there, not knowing which ones will work or not. However, the first decision to make is to decide if you want to pay for a VPN, or if you want a free VPN. There are advantages and disadvantages to both. The first issue you have to consider when thinking about using free VPN vs. paid VPN services is privacy. Just how bothered are you about it? If privacy is at the forefront of your considerations when looking to use a VPN service, then move straight to a paid VPN. On the whole, a very large percentage of free VPNs will not provide good privacy. After all, they need to make their money somehow. When using a free VPN, you risk having your browsing activity sold to third parties for advertising purposes. In fact, almost all free VPNs that offer good privacy will be very restrictive in their usage. This is a tactic they use to make you want to buy a premium subscription package. Using a paid VPN service, however, means that the service provider can provide private connections. This is because they have covered their own costs with your paid subscription. The VPN software can also keep updated throughout your time using it, ensuring that the latest VPN encryption is kept updated, and no (or few) logs are kept of your browsing history. When using a VPN in countries where it is illegal, or internet services are blocked – there is always a risk when using VPN. Using a VPN in China shouldn’t cause you many issues when using it as a foreigner for personal use. 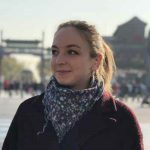 There have been very few documented cases of foreigners getting in trouble in China for using VPN services, however, there have still been some. You can check out our blog post on the legalities of VPN here. Providing support costs. Using a free VPN, the VPN service provider will not provide you will support if you are not paying for it. So, if there is ever an issue with your VPN and you won’t have a support team at hand. You may then find yourself stuck and unable to waste time on your favourite social media sites for the next few hours! Even worse, maybe your VPN breaks or gets blocked completely. Then you have to go through the trouble of trying to download a new VPN in China if you don’t have a backup VPN already. This is something that is difficult to do, but not impossible! This is something you should take into consideration before choosing to use a free VPN service. If you’re looking for high internet speed and unlimited usage, there are only a few free VPNs out there that offer this. Just like with anything, you can’t have it all. If internet speed and unlimited usage is the most important factor for you, with a free VPN you will have to compromise somewhere else. When choosing paid VPN services, there are multiple options. This means you can choose a package that fits both your needs and still fits within your budget. For example, internet speed may not be important, but unlimited usage is. Or vice versa. With a paid VPN service you are almost always guaranteed better internet speed and connection than when using a free VPN. You have to make sure that the paid VPN is a decent one and offers a package that suits you. Check out our blog here for our top 5 paid VPNs. A free VPN service needs to make its money somehow. So apart from selling your browsing data onto third parties, there is high chance that you will also have to deal with advertisements every time you use the VPN. Otherwise, the free VPN service may bombard you with things to entice you to pay for it. If your VPN service provider also offers a paid VPN service, there will most likely be a lot of restrictions on your free VPN subscription. These otherwise aren’t there if you choose to opt-in for a paid premium subscription. When it comes to free VPN vs. paid VPN services, you really do get what you paid for. The only true advantage of using a free VPN is just that – it’s free. Otherwise, there are many more disadvantages to consider. If you’re going to be in China for an extended time (and not just a weeks holiday), or planning to use your VPN over an extended period of time, it is worth investing in a paid VPN, we strongly recommend this. 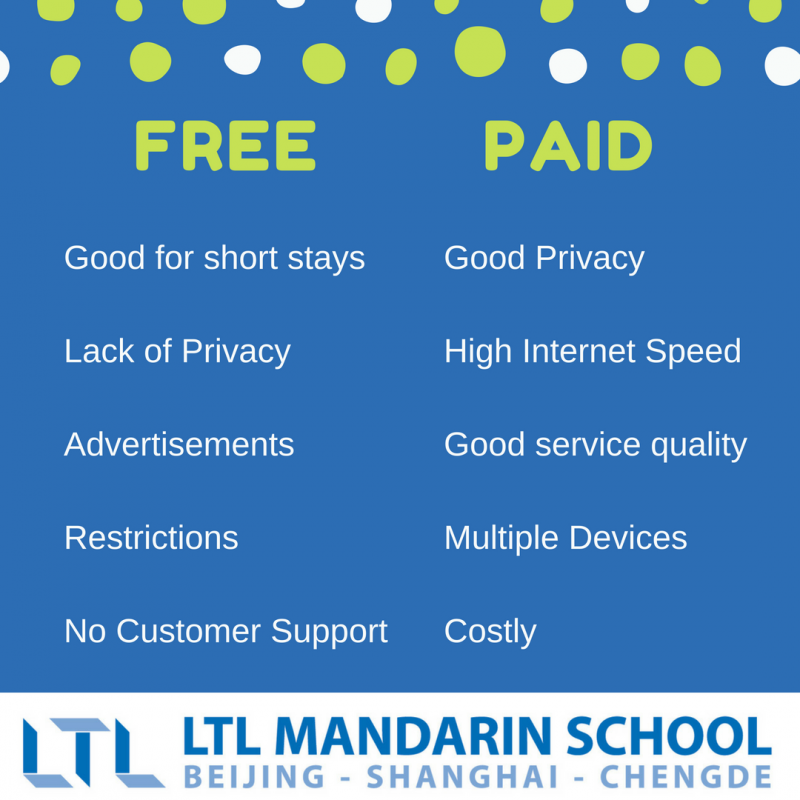 A paid VPN service ensures privacy, internet speed etc. It will become an essential part of daily life if you plan to live in China. However, if you’re willing to compromise and money (or rather lack of it) is at the forefront of your considerations, free VPNs can be reliable and save you a good amount of money each year. However, you have to be aware of the risks. If you decide to use a free VPN service long term, it is best to download a couple of VPN services to use as a back-up in case one doesn’t work. Next step. Now you’ve made up your mind on whether you wish to choose a free or paid VPN, you’re faced with the challenge of which one. Don’t worry! We’ve compiled a list of the best PAID VPNs in 2018, as well as the best FREE VPNs in 2018. Thanks for sharing this informative article. VPN is helps you to secure your connection. Dear...Thanks for sharing this informative blog.